Not just sea and shopping... in Riccione there is something fun for everyone! 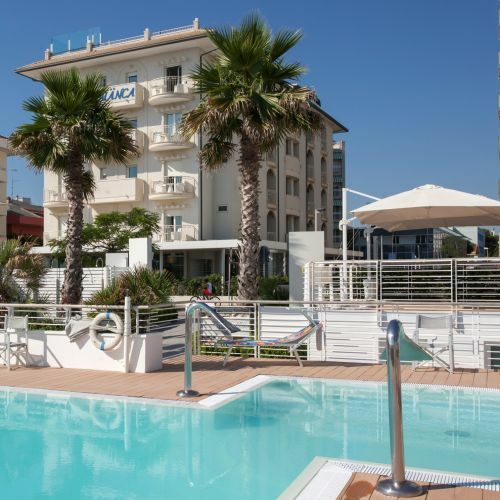 The 3-star superior Hotel Cà Bianca in Riccione is located in a prime location, ideal for getting to the main amusement parks in the Romagna region – and all at no time at all. What’s more, to ensure everyone has fun and to give you the opportunity to spend your days at the parks in a calm and stress free way, you can purchase your entrance tickets at our hotel reception – skip the queue and pay discounted prices. Don't forget to check out the special promotions page of our website: during certain times of the year we organise holiday packages with entrance to the parks included in the price! This is the new scientific-nature park in the hills of Riccione: this pays homage to our planet and to our sea, where stimulating educational content enriches our entertainment and experience. You can take advantage of discounted tickets without the queues, while the little ones will receive a nice free gift... and the next day admission is free! The legendary water park famous throughout Italy offers audiences endless thrills thanks to its breath-taking slides, water games surrounded by greenery and many chances for entertainment for the little ones. Even the kids will find a thousand ways to have fun in the wave pool with disco and grand night events, such as the famous foam party. A theme park dedicated to the historical, architectural and cultural heritage of Italy and Europe, brought to life through an original walkway made up of miniature reproductions of the main Italian and European monuments: a mixture of creativity, games and learning that will amaze you and make the park unique. An amusement park truly made for children, where reality gives way to dreams and fantasy. Kids love to spend special days in Fiabilandia, surrounded by nature and captivated by the numerous events and shows, which are also suitable for very small children! For an unforgettable day, this park offers a truly unique setting: the mysterious world of sharks, the underwater laboratory, the 3D movie “Invisible Ocean “, the "Poisons" exhibition and much more.